China’s struggling auto sales, German automakers fighting stricter emissions regulations, an American leading the Volkswagen North America arm, joint ventures in China and talks about ethanol. All of this and more in The Morning Shift for Thursday, Oct. 11, 2018. Chinese auto sales aren’t doing as hot as the industry has grown to expect, and it’s to the point where that country’s dealers want a major cut to the sales tax China puts on vehicles. Reuters reports that unnamed sources said there are worries China’s car market could shrink for the first time in decades this year. This is important globally, because China is the largest market for vehicles in the world right now, and a stall or shrinking of that market would be a huge blow to pretty much every car company. That’s why Reuters reports that two unnamed sources said the China Automobile Dealers Association proposed last month that the current tax of 10 percent on car purchases be halved. The influential body has made proposals in previous years that have helped shape auto policy. When China last cut the purchase tax three years ago, car sales soared in the world’s biggest auto market that is a key battleground for global car makers from General Motors to Toyota Motor. 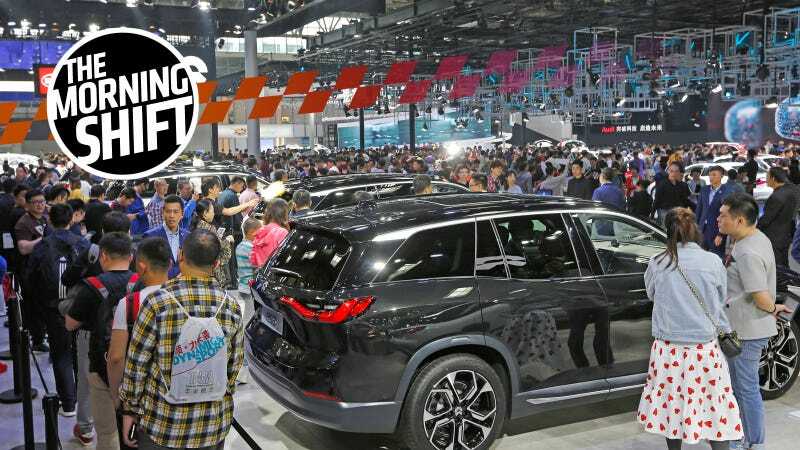 CADA’s initiative comes as Beijing itself seems concerned about China’s auto industry, an important barometer of the health of the world’s second largest economy. It has launched stimulus measures as a bruising trade war with the United States is pressuring economic growth. One of the people said the commerce ministry met with automakers this week to discuss the market and ways to spur growth, which included purchase tax cuts - a signal the central government may be warming to the idea. Volkswagen Group’s North American arm will get its first American CEO in 25 years when Audi’s Scott Keogh takes over at the start of next month, according to Automotive News. Giving the top company job in North America to someone from this continent may not sound like a big deal, but for a company as true to its German roots as Volkswagen, it kind of is. Keogh is currently president of Audi of America, and an Audi announcement said the head of Bentley Motors’ American arm, Mark Del Rosso, will take over as Keogh’s role at Audi. The decision not only shows that Volkswagen is trying to be more regional with its leadership, decision-making and product lineups, but also that it’s trying to capitalize on Keogh’s good record at Audi. Keogh joined Audi of America as chief marketing officer in 2006, when the brand had about 90,000 U.S. sales annually. With a focus on brand building and customer satisfaction, he helped grow the brand over the next dozen years into a premium powerhouse that rivals BMW, Mercedes-Benz and Lexus. He became president in 2012. Audi has the U.S. industry’s longest string of year-over-year monthly sales gains at 107 months. The brand last recorded a monthly sales decline in October 2009. In 2017, Audi totaled U.S. sales of 226,511 vehicles, an increase of 7.8 percent from the previous year. This year through September, the brand’s U.S. sales are up another 4 percent from a year earlier to 167,420. Keogh will be the first American to lead Volkswagen’s North American arm since John Kerr left in 1993 amid big sales declines, as cited by Automotive News. No pressure there. On Tuesday, we wrote that Germany hasn’t been on board with a lot of other nations in the European Union in wanting stricter emissions regulations. You see, Germany is fine with stricter regulations, as long as they’re not too strict. We can’t risk harming industry for the sake of preserving the earth, you know. “It is more than regrettable that the majority of member nations did not find the strength to strike a balance between protecting jobs and protecting the climate,” VDA president Bernard Mattes said in a statement on Wednesday. “Job security is lessened and Germany as an industrial location has been weakened,” said Mattes, a former chief of Ford’s German operations. The VDA represents automakers such as Ford, Volkswagen, BMW and Daimler. “With yesterday’s vote we missed a chance to shape CO2 regulation for the time after 2021 in an economic and technologically realistic manner,” Mattes said. Volkswagen Group CEO Herbert Diess warned that the CO2 target could have dire consequences. “An industry can collapse faster than many believe,” Diess told the daily Sueddeutsche Zeitung on Wednesday. You know what also has dire consequences? Dying. Earlier this year, China announced it would phase out its regulations keeping foreign companies take control of local manufacturing joint ventures. China used to have a 50-percent ownership cap for foreign owners, but not anymore, and the gave Volkswagen and BMW permission to take control of theirs in July. BMW acted on its new freedoms, with Bloomberg reporting that will put $4.1 billion into taking control of its joint venture with Brilliance Auto. That makes BMW the first automaker to take majority control of a local Chinese partnership since China loosened the rules, going from a 50-percent stake to 75 percent. The agreement gives BMW a bigger say over its business in China, and lets it keep more of the earnings it generates in the massive market. China is a key focus for all major car companies, but sales of luxury vehicles have been coming off as the trade war with the U.S. damps consumer demand. The deal will help BMW lessen the impact of higher tariffs imposed in the trade fight, as it now plans to boost manufacturing capacity in China and expand local production of models including electric cars. Bloomberg has more on foreign automakers in China and how the loosened rules will impact them here, if you want to read about more than just BMW. President Donald Trump announced Tuesday that he’s told the Environmental Protection Agency to begin working on allowing 15-percent ethanol fuel to be sold all year, according to the Des Moines Register. The current standard for corn fuel is 10 percent ethanol, and there are strict rules on how often and when E15 can be sold. American Petroleum Institute President Mike Sommers said the E15 shift “is not in the best interest of consumers” because using it risks engine damage in older cars on the road today. Because ethanol is corrosive, critics say E15 can cause damage to cars, especially older ones. For years, some auto manufacturers explicitly threatened that warranties would be voided if motorists use the fuel, but major automakers have backed off from that opposition. Ford Motor Co., which was one of several manufacturers to warn in 2011 of potential damage to engines and fuel-supply systems, is no longer against E15 and has built its vehicles to be capable of running on the fuel since the 2013 model year, said John Cangany, a company spokesman. Bloomberg has more on the positives and negatives of ethanol here. Apollo 7 launched on Oct. 11, 1968, according to History. It spent 11 days in orbit and the crew transmitted the first live television broadcasts from orbit. Neutral: Do All of These Environmental Reports Freak You Out? Or are you just chilling, relaxing, waiting to see what we as a human population screw up next?